You can do anything, but not everything. Paul Thompson is an award winning London-based photographer, best know for his large, intricate group shots and advertising work. In stark contrast however, it is his personal work (mostly) of seascapes that are truly breathtaking. His ability to portray solitude without loneliness is flawless. 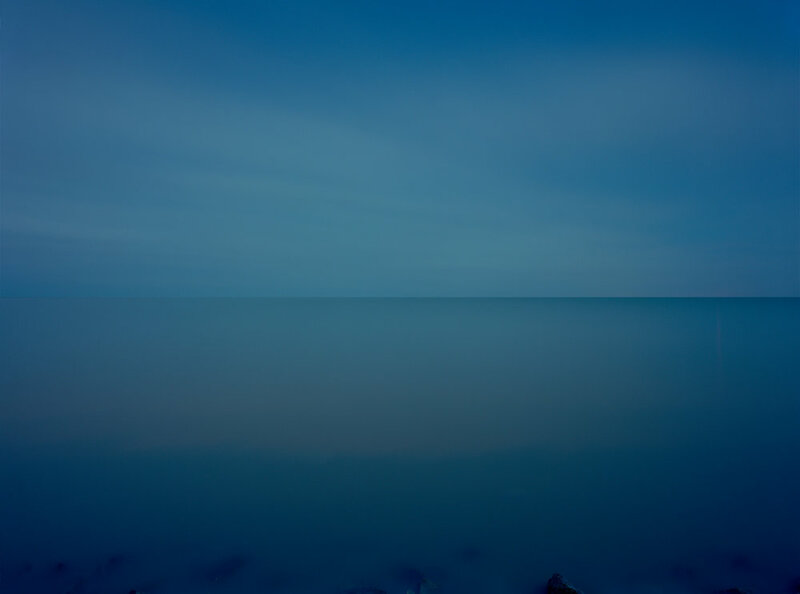 With this issue titled “From the Water’s Depth” I felt it rather fitting that we showcase some of Paul’s work from three of his photography series, namely; Moonlight, -18 Degrees and Navigate. Despite there being not a single human in any of the shots (beyond perhaps reminders of things we have left behind) one cannot deny the untainted beauty portrayed in his work, and the endless inspiration I take from it. On asking what his inspiration was for creating these three series: "We live in such a world where everyone wants everything yesterday, and a hundred versions just incase. These projects are the polar opposite. Which is why I love making them. Photography stripped back to it’s original form." He strives to the capture the movement of time. Watching it move through water, light and sky. What's your preference. People or solitude? 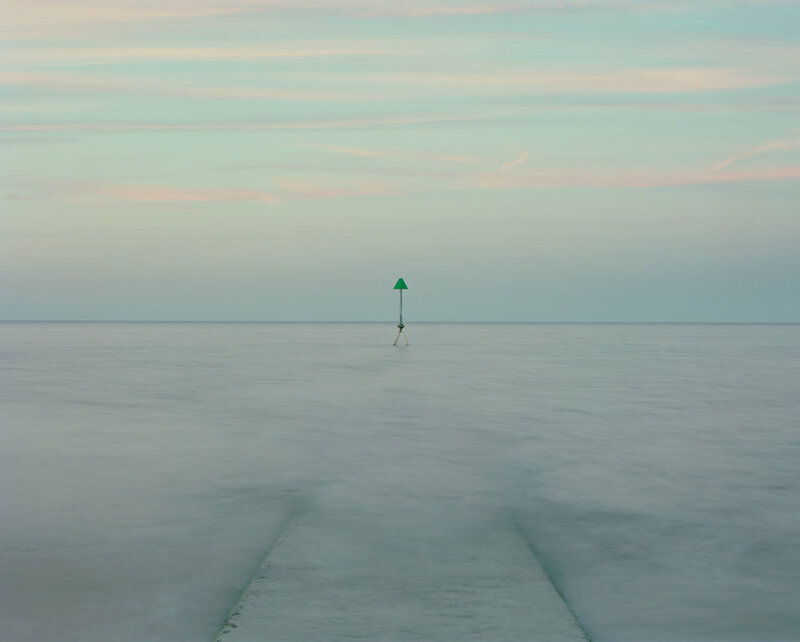 Image courtesy of Paul Thompson, from the series 'Navigate"
The first series, Moonlight began about five years ago. As the title suggests, all the images were taken at night during a full moon. Each image took between 1 - 3 hours to capture. Taken on a large format camera and his beloved film. "I spent my childhood on the cold and wild coast of the North East of England, and as an adult, I’ve returned time and again to the sea. Moonlight is a lonely labour of love; I have now spent more than five years venturing to the English, Italian, Scottish, and Welsh coasts on dark nights, with only the moon to light my way. Moonlight is ultimately as much about illumination as it is about darkness, recalling the night seascapes of 18th-19th Century European Romantic painting, particularly the works of fellow Englishman J.M.W.Turner, known as “the painter of light,” whose rushing waves and shifting skies routinely veer into the realm of abstraction. These places are familiar to me; I visit them in daylight too, and I have researched many of their histories. But the title Moonlight has a dual meaning: not only were the images created under the glow of the full moon, but some of them recall scientific photographs of lunar landscapes, forever ingrained in our collective memory. They both are and are not of this planet. Human activity and development are destroying some of our planet’s coastlines, but Moonlight is not a eulogy to what’s lost. It’s a homecoming to all the places we might have forgotten somewhere along the way. It’s also an enduring reminder that when all is said and done, the feral ocean never bends to the whims of mankind. 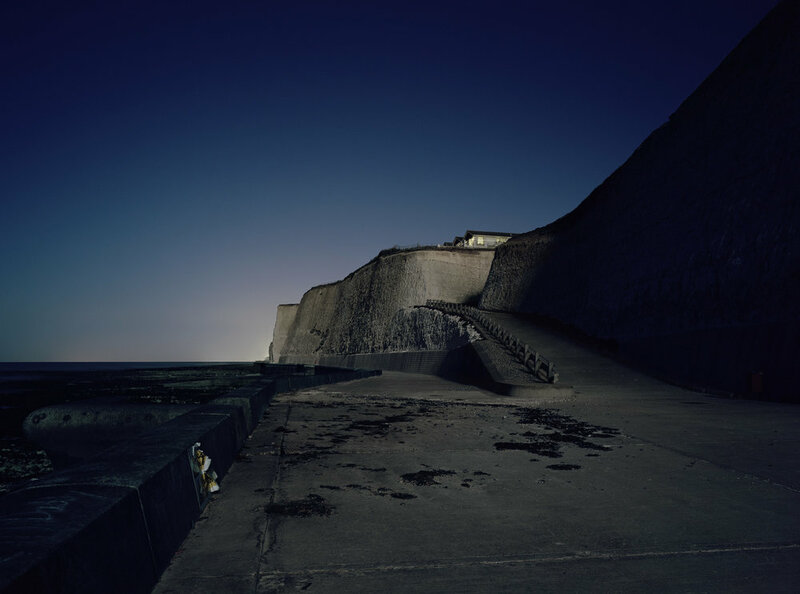 We see traces of human life in many of the Moonlight photographs— lights, trails, concrete— but while we might own these places during the day, they belong to the sea and the moon at night. For this reason, the Moonlight pictures might be unnerving to some viewers, but for others, like me, they are a comfort and a respite from a busy, noisy world." Much like the first series, - 18 Degrees was shot only at full moon on a large format camera using long exposures to capture every minute detail of time moving though light, sea and sky. "These are photographs of a world without daylight. Each is made on large-format plate film, on the night of a full moon, and after astronomical dusk, when the sun has dipped to more than -18 degrees below the Earth’s horizon. I shoot the -18 Degrees photographs on the coasts of Great Britain, Italy, Wales, and Scotland, long after everyone else- save perhaps for the rare fisherman- has gone to sleep. I stay out all night, and the shutter of my camera remains open for one to three hours at a time. Digital technologies have made it possible for photographers to make similar images in shorter exposures, but for me, there’s magic in the silence of waiting. Throughout the night, the shore shifts; the waves blur, and the clouds dance across a monochromatic, moonlit sky. 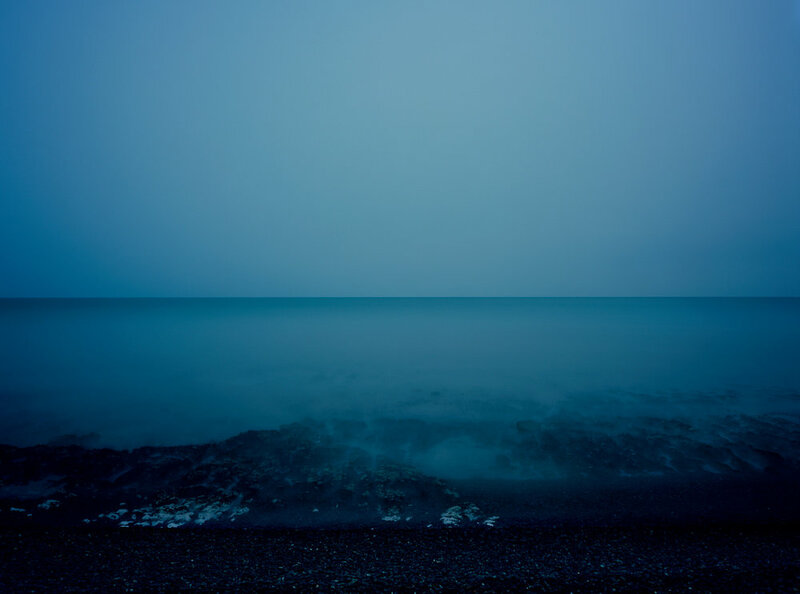 As with Seascapes by Japanese photographer Hiroshi Sugimoto, the -18 Degrees images are bisected horizontally. The frame is broken into two equal halves; one is water, and the other is air. The similarities shared by the pictures highlight their differences; each one diverges from the last, and none can ever be replicated. Unlike Sugimoto’s photographs, mine are in colour, and while comparisons to abstract expressionist Mark Rothko are inevitable, -18 Degrees also recalls the work of the post-war French painter Yves Klein. In 1957, five years before his death, Klein trademarked his own shade of blue: International Klein Blue, or IKB. Two years later, the artist gave a lecture at the Sorbonne, in which he famously said, “Blue has no dimensions.” He believed that pure blue, because it was the colour of the sea and the sky, could somehow connect us to the most abstract aspects of our existence. Unlike my Moonlight series, -18 Degrees has no dimensions. There are no identifiable objects interrupting the frame, and the eye is anchored nowhere. The photographs take a long time to make, and they ask for our time in return. We try to take a brief glance, but we end up hypnotised by the borderless expanse of blue. I’ve wondered if these photographs are too simple- if, like Klein’s 200-plus blue paintings, they could be seen as blank or empty. But within the void, on these endless nights spent at sea, I find something to hold onto. -18 Degrees has given me license to return to an essential and ineffable aspect of what it means to be alive. These are not photographs of nothing; they are photographs of everything." In his latest series, Navigate - which has been in progress for the last 18 months - Paul photographs these simple structures used for navigation and protrude from the water. He photographs them as if they were people sitting for a portrait. All unique in their similarities. 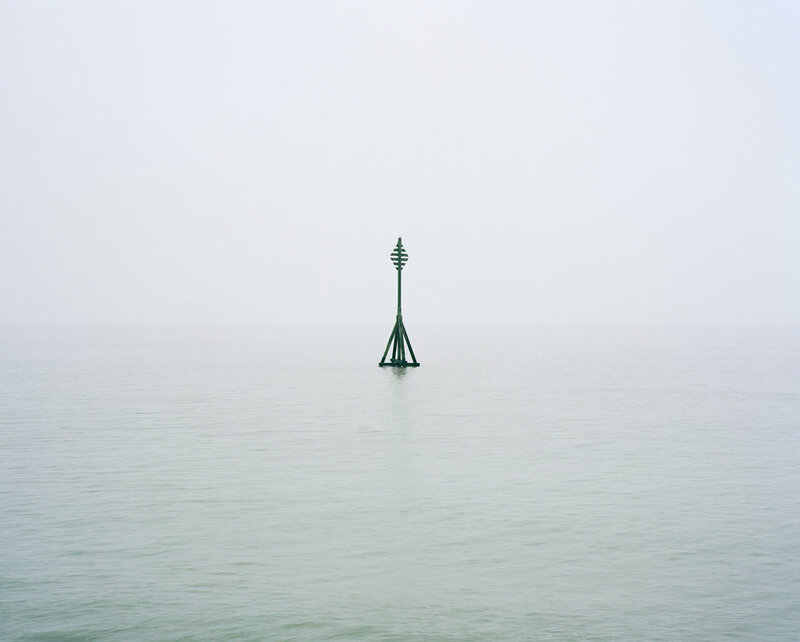 "I’ve walked past these navigational aids hundreds of times without paying them any attention. I grew up on the North East coast, and I have no memories of ever having seen them as a child. Recently, I noticed them for the first time, and now, I find them on beaches all over the United Kingdom. For those of us on land, these markers can be inconsequential and therefore invisible, but for people out at sea, they are vital. They guide mariners into port, indicate the end of a jetty, and warn of dangerous, unseen rocks. Glimpses of red, green, and sometimes yellow poles in the distance tell ship captains when to stay left and when to steer right. Lighthouses have long been beloved and romanticised by artists- think John Constable, Paul Signac, Edward Hopper. In the 1880s, the painter Winslow Homer even moved into a lighthouse and kept himself relatively isolated from the outside world. Navigate is not about lighthouses. These small and unexceptional markers have not inspired generations of men and women, and that’s part of their appeal. In my estimation, I have devoted days, if not weeks, to finding these structures on foot. I’ve walked more miles than I can count, and since I embarked on the project, others have started recognising them and pointing them out to me. I shoot the Navigate pictures at sunset on large format film. Exposures last anywhere from one to eight seconds, and in that time, I have little control over what happens. The light at dusk is unpredictable; the tide is constantly in motion. The only thing that doesn’t change is the marker itself. In 2008, Yale University Press published the essay “Notes on Photography and Accident” by the artist Moyra Davey, who poured through the writings of Walter Benjamin, Susan Sontag, Roland Barthes, Janet Malcolm, and more in hopes of defining the role of happenstance in picture-making. In the digital era, most images have been meticulously planned for our consumption, and there’s little room left for twists of fate. Navigate, on the other hand, is a series of chance events, dictated by the sea and the wind. I recently returned to the site where I had previously noticed a jetty marker knocked over by the waves. By that second visit, the old marker had vanished; in its place, I found a brand new one. While luck shapes much of the process behind Navigate, the final images find order in chaos. We often think of “man” and “nature” as two warring bodies, but in these photographs, I find harmony. As with some of my previous bodies of work, the pictures are split horizontally down the middle: sky occupies the top half of the frame, and water fills the lower. But in the case of Navigate, the photographs are also bisected vertically by the markers themselves. In every image, you’ll find a cross or a plus-sign, usually (though not always) in the center of the frame. Here, the sea - feral and primordial - and the markers - rigid and manmade - exist for just a moment in equilibrium. The form and composition of the Navigate photographs mirror my own experience making them. When I wander the beach at golden hour, watching for last light, I am at peace with the rolling of the waves. Tomorrow, the tide might come and wash us all away, but for now, at least, we rest." want to own oneof these enduring images?